If you do not think that the deal that President Trump offered to the Democrats to reopen the government was an acceptable compromise, what would be? If you oppose any compromise, please indicate that. I think that a reasonable potential counter-offer would be a longer extension or even requiring that the legalization of the status of the so-called “Dreamers” be made permanent. They don’t have a mens rea. Demanding that they pay a fine or that citizenship be permanently foreclosed to them is not reasonable. Contrariwise, demanding that the deal be extended to the parents of the “Dreamers” is wrong, too. They do have a mens rea and there should be substantial consequences. 2. Push the “border wall” issue past the shutdown into a broader debate on immigration that includes DACA, TPS, the status of people here illegally (most of whom are not illegal border crossers), guest worker programs, and, yes, border security. So the compromise is for Trump to capitulate? What so bizarre about this whole affair is how low the actual stakes are. The ~$5 billion in funding is essentially meaningless and likely would not make any kind of identifiable statistical difference one way or the other. So, on the merits, I don’t think this funding measure is of much consequence. So the result is that this fight is entirely political. The stakes have nothing to do with border security, it’s all about pleasing the base and saving face and scoring a political win. That is the core of this dispute. As long as that remains the case, any attempted compromise on the merits is probably irrelevant. If you have one side that needs “win” on the wall and the other side that needs to deny that “win”, then it’s hard to see what sort of political compromise could satisfy both sides. There isn’t a middle ground when the question is inherently binary. Pelosi has taken an absolutist position, so I don’t see what is accomplished by reopening the government except relieving the pressure to act. The notion that Democrats will suddenly negotiate in good faith is ludicrous. This issue is decades old. The notion that suddenly the issue can be resolved is highly dubious, especially since the Democrats are currently taking positions 180 degrees from prior positions. Read: unprincipled. It’s an ugly situation, but sometimes they just are. Unforeseen events will break the impasse, nothing less. I am not a hostage. The politics of this are not about pleasing a base or getting an election win. The politics are, “what kind of society do we want?” We’re way down the path of Fortress America. Funding that wall, however stupid it is, confirms we’re still headed in that direction. We’re way down the path of Fortress America. Funding that wall, however stupid it is, confirms we’re still headed in that direction. I guess you’re right in a broad-brush sense, but that just proves the point that this current fight isn’t about the merits of wall funding and thus there is no compromise to be had on the merits alone. The notion that Trump will suddenly negotiate in good faith is ludicrous. (Nice piece from the Sinclair group, conservative, on what has happened in the past.) As I said before, the wall will have negligible effect on border security, it is just that Trump needs it to please his base. The Dems should use this to get stuff they want, but it has to be permanent. (Still have not found any references to adding in parents.) They need to assume that Trump will renege on anything that is not. They should ask for DACA and TPS, then they should concentrate on actual border security. Lets see increased funding for E-verify. Increased funding to stop drugs at legal points of entry. Increased funding for judges and their support. More funding for border agents and modern methods of control like drones, airplanes, balloons, motion detectors, whatever. In the ideal, they vote to put govt back to work first, then make a deal. That eliminates the moral hazard issue of rewarding someone who takes hostages. However, since Trump and his supporters care more about winning than the federal workers, remember that they think they are all Democrats anyway, just dont think that approach works here. I’ve linked to that before for you. Here it is again. Perhaps the graph isn’t clear enough. The “Fortress America” trope does not conform to the facts. It did from 1910-1950. It has not since 1950. And that’s just legal immigrants. When you add in the illegal immigrants it’s even more astonishing. I, for one, am not interested in a return to Fortress America. I am interested in establishing some level of control. 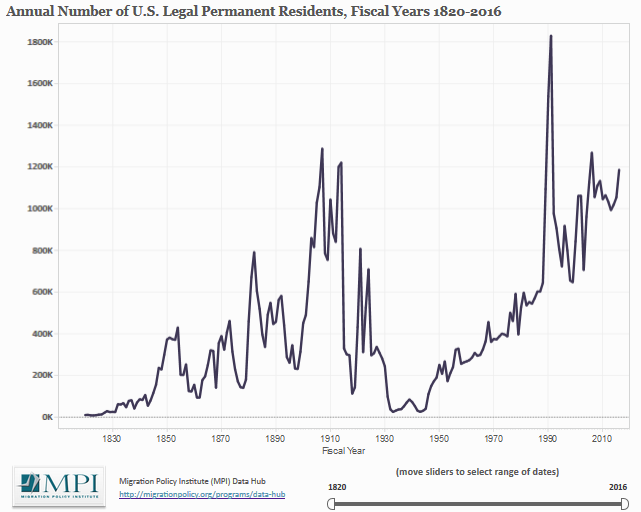 We already have the highest proportion of immigrant population in our history. Characterizing it otherwise is an error. Giving parents of DACA recipients a path to citizenship only leaves grandparents more vulnerable. A fund needs to be set up to secure their financial needs, since we’ve robbed them of their extended family structure to secure ourselves maids and groundskeepers.